No other stone is associated with royalty quite like the Ruby. In Sanskrit, Rubies are called “Ratnaraj” which means “King of Gemstones.” They are revered in the Bible and in Sanskrit writings as being the most precious of all the gemstones. In ancient India, whenever an exceptional Ruby was uncovered, the Emperor would send out court members to meet the ruby and welcome it into their community. It is not difficult to see why Rubies have always been a highly decorated gemstone. Rubies are one of the toughest stones on the Mohs hardness scale, so they are very durable. At the same time, they are exceptionally brilliant and colorful stones. The deep red of Rubies conjures up images of heat, passion, and love. The powerful feelings that Rubies evoke make them a wonderful and meaningful gift. 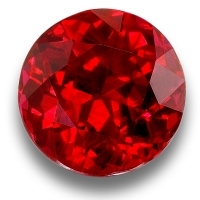 The most important aspect of a Ruby is the color. Moderate amounts of inclusions do not affect the price of a Ruby so much as the color will. High quality Rubies are difficult to find; but large, high quality gems are quite rare and very expensive. Smaller sizes of Rubies can still be pricey depending on the quality, but are not generally unaffordable. Rubies come from all over the world. Mines are found in Myanmar, Vietnam, Thailand, Northern Pakistan, Kashmir, East Africa, Tadschikistan, Laos, Nepal, Afghanistan, Madagascar, and India.